One of the reasons it’s so fun to watch the Olympics is because of how we fall in love with the athletes. And when America was first introduced to Team USA gymnast Aly Raisman in the 2012 Olympic games, it was love at first sight. Since that time, she has not only appeared in the 2016 Olympics as well, but she’s been a world class celebrity as well. Because Aly isn’t just known for her outstanding ability in the gymnasium. Her name has also gone viral for her talent in the Instagram world, and most notably, her stunning photos that she loves posting. It’s time for you to buckle your seatbelts, because we’re about to show you some of the best pictures she’s ever shared onto social media. When you watch her do her acrobatic thing on television, it’s certainly impressive, but she remains to be a spectacle. An untouchable athlete for us to simply marvel at, without really getting to know. On Instagram, it’s a completely different story. Aly invites us into her world behind closed doors, and allows us to get to know her in a more intimate sense. Aly Raisman is a girl who has learned how to roll with the punches, turn lemons into lemonade, and produce some pretty incredible Instagram pictures along the way. Don’t believe us? Just see for yourself; you can thank us later. It’s one thing to take one selfie that you believe will entrance the hearts of your fellow Instagram followers, but it’s another thing to take two. In this day and age, the world of social media enables selfie enthusiasts to try all kinds of different things, and that means taking multiple pictures without worrying about taking a bad one. When that happens, sometimes you can strike gold – and we all know how good Aly Raisman is at winning things that are gold, right? Being the winner of an Olympic gold medal herself, she is no stranger to winning – and being Instagram dynamite is just another one of those things. This is the type of picture that makes us just want to hang out with Aly Raisman all day. Just seeing her relaxing the way she is in her squeaky clean, modernized kitchenette, legs crossed and sipping a soft beverage, it certainly shows us that there are some breaks in that rigorous athletic schedule of hers. Being a gymnast can certainly be tough, and to be an Olympic gold medal winning gymnast must have required her to work her tail off, day in and day out, since she was a little girl. It’s nice to see that she allows herself to kick back once in a while, expressing herself in her colorfully designed dresses, as well. Have you ever seen anyone look this good in a two-piece outfit? Okay, perhaps that’s a broad question, but seriously – Aly Raisman is absolutely killing it here, and she knows it. From her white high heels which she’s displaying ever so gracefully, to her propped up ponytail, the entire picture she’s put together speaks absolute perfection. And then of course, her white top and grey skin tight mini skirt complement her tan skin beautifully. Aly certainly loves to goof off, as you can see in this picture. We’ve all had those moments as children where we’d turn our head upside down like she’s doing here, and imagine what the world would be like if it indeed was upside down. Perhaps there’s something we can learn from this… Often times in life we find that a situation is exactly the opposite from which we originally thought, and Aly’s letting us know that that’s okay sometimes. This photo that Aly posted on Instagram was a groundbreaking moment for her, not because of how she looks in it, but because of what her caption for it was. After people had begun to shame her and her fellow gymnast McKayla Maroney for wearing outfits that they deemed “inappropriate,” she responded with this picture – and a caption stating that people should dress in what makes them feel good. We can’t argue with you there, Aly. There are many types of poses one can make while taking a picture, and one of them is the “no look” pose. While we are normally accustomed to Aly wowing her viewers with her deep eyes, and her 100 watt smile, she’s decided to go a different route here. By looking away from the camera nonchalantly, she gives off the impression like she doesn’t care – and of course, that makes us care more… Well played, Aly. 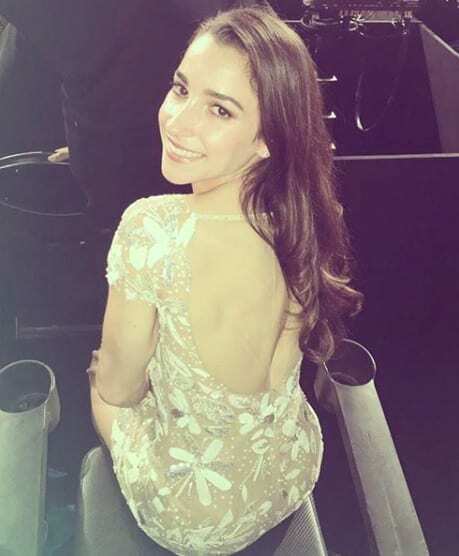 Well, it looks like Aly Raisman is ready for a fun night out on the town! And her outfit is popping out in all of the best ways, in a fashion that only she can pull off. The cool thing about fashion is that it’s really a one of a kind way to express yourself, and what she’s wearing here is coming at us in waves like we never could have expected. That pink blazer is quite the statement, especially considering its contrast to the black top underneath it. This picture looks like something that you might find in a fashion catalog for high schoolers just entering the throes of adulthood, and are ready to make their mark on the dating world. Even more interesting is that this particular outfit she’s wearing looks like it might have been straight out of the ’80s. But hey, she looks great in it, and we’re quite glad that she shared it with us on her Instagram page. 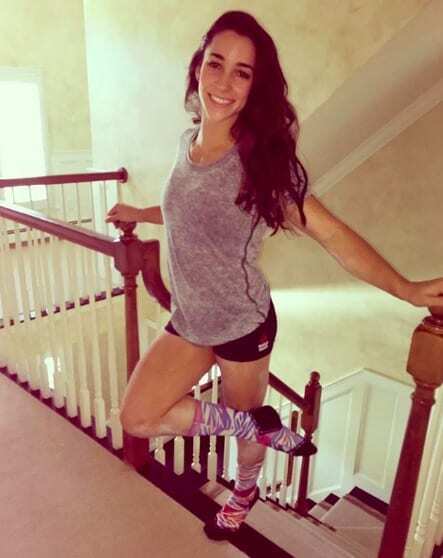 It looks like Aly Raisman is preparing for a high class event here, and it seems that she’s decided to invite us into her intimate preparation process. There’s nothing that says “I’m ready to tear it up tonight” quite like a low-key, nonchalantly executed selfie at home, and we’re glad she decided to show this one to us. With the stylish dress she’s wearing, it looks like she’s going to stun some of her peers tonight, – as well as any photographer who might catch her in his lens. No matter who you are, whether you’re a social worker, fireman, doctor, or an young Olympic gymnast like our girl Aly, there is something you probably all have in common – you love your hot tubs. How could you not? Look how relaxed she is here, with an expression of pure bliss that can only come from feeling the steaming jets of this pampering tub. It’s pretty much as chill a situation as you can find. When Aly posted this picture of herself on Instagram, it was flanked with a confident message to the public. She advised people to stop spending so much time on their phones, and start living their lives. While she isn’t the first one to relay this message, that doesn’t take away from its potency in the slightest. That being said, if we weren’t on our phones, we wouldn’t have been able to see this wonderful picture of Aly here, so perhaps it’s really all about moderation. Given the fact that Aly is a world renown athlete, it makes sense that you’d see here at a red carpet event such as the ESPYs. Except in this picture, she isn’t getting ready for the ESPYs – she’s getting ready to go to the Golden Globes. Perhaps when you achieve a certain level of fame, it doesn’t matter what field you’re in – you pretty much get invited to all of the high class events, and it looks like she’s pretty ecstatic to be included. They say that a big part of a person’s character is revealed through the type of socks that they wear, and if that’s true, then Aly is one of the coolest character’s around. Just hanging around at home, she decided to dress comfortably with a soft grey tee and black spandex short-shorts. But the cherry on top that rounds out her outfit, or should be say cherry toward the bottom, are her razzle dazzle style, wackily designed, multi-colored socks. There are few interesting things going on in this picture that are enough to make any man clamor to get Aly’s number. First of all, that dress she’s wearing has a unique design that sort of just pops out at you, and she certainly looks amazing in it. But we especially like what she’s doing with her ponytail. Running her hand through it is suggestive to any potential suitor, because it makes them wish it was their hand there instead of hers. It seems like every day now that we’re getting to know another female athlete who is also some sort of a fashionista extraordinaire. Aly Raisman is one of the newest and youngest ones around, absolutely killing it on the field as well as on the red carpet. Just check out this dress she wore to NYC Fashion Week, a skin-tight, sheer, silver and gold-embellished dress, which probably got a few people to do their own type of gymnastic flip just to catch a second glance. It’s surprising how different a person can look just because of the dress they’ve chosen to put on. For instance, we’ve gone through many of Aly’s Instagram pictures in this article, and they’ve all given of a unique type of energy. This picture? We’re getting a decidedly “tender” vibe. With her short dainty dress, and her innocent smile, she looks like a gentle princess – a look she pulls off with as much elegance as she does the no-nonsense workout outfit she has on in the background photo. 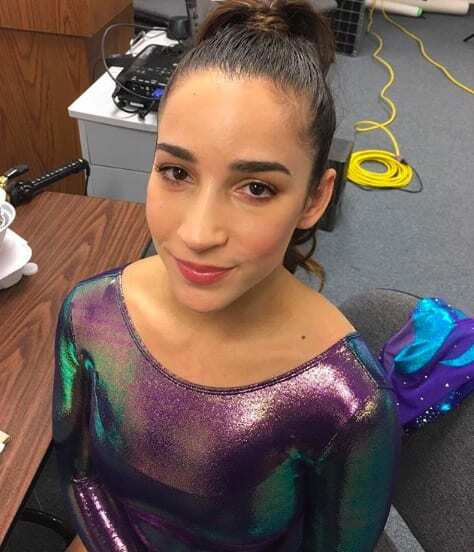 Our caption for this picture runs on two levels, because the outfit Aly’s wearing an iridescent gymnastics uniform, which in her case would imply that she is “at the office.” However, based on the background of this photo, it looks like she’s sitting in an actual office! You know, like the kind that you might find in a corporate office building? Still, even though the outfit doesn’t exactly match the setting, she manages to pulls it off as per usual. On her caption for this Instagram post, Aly wrote “best way to start the morning.” Well, when you have a dog at cute as that one, we can certainly see what you’re talking about! But in addition to her beloved dog that’s wrapped in her arms, we’re sensing something more. There’s something in the look in her eye in this picture that suggests a level of satisfaction and confidence that we’d wish for anyone to have when they wake up in the morning. Staying under the radar is not something we can imagine is easy for Aly to do, especially not when she’s looking like this. From the glittering flowers on her slightly see-through dress, to her radiant smile that doesn’t seem to quit, we’re not surprised this girl’s Instagram account is as popular as it is. We’re happy that she’s allowed us to be a part of her journey, because it’s certainly made the world a brighter place.